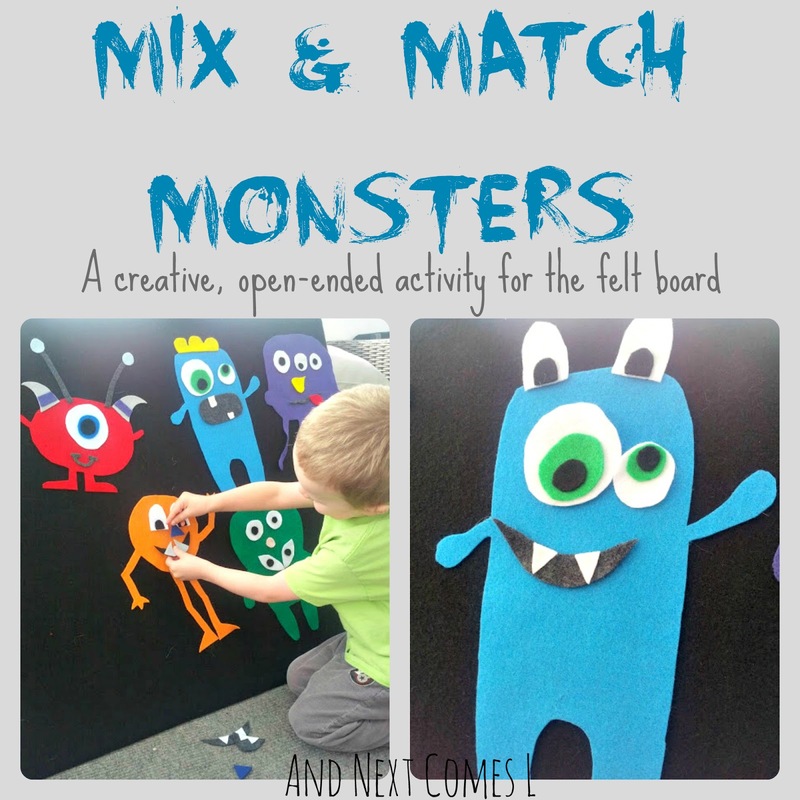 While brainstorming up new felt board activities, I decided it would be fun to make some mix and match monsters, similar to our mix and match owls. So I came up with this felt monster set, perfect for building and creating a wide range of hilarious little monsters. It's a perfect quiet time activity for kids and is a really great way to explore emotions on the felt board. The pieces can then be assembled to build monsters like these. 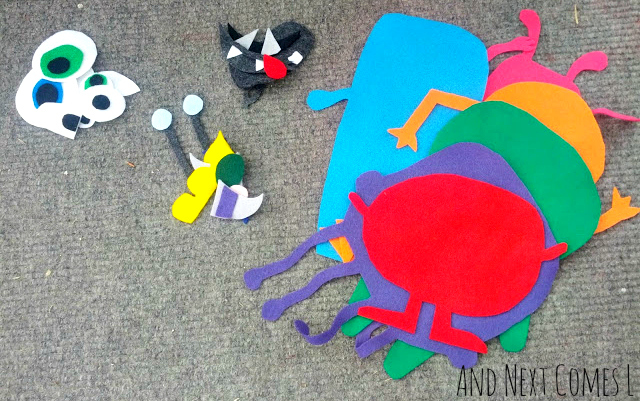 Since Spring has finally arrived, the boys and I explored the new felt monster set together out in the sunroom. See, it's a good thing I haven't hung up our new felt board yet. It can easily be moved from room to room. Anyway, K showed no interest in the monster set, whereas J spent a lot of time over the weekend playing with it. 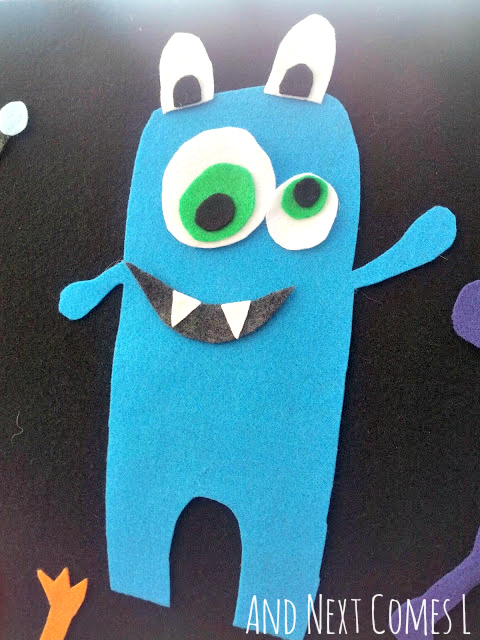 Here are a few of his cute monster creations. J even spent some time playing around with the emotions of the monsters, turning their smiles upside down to make them sad. So apparently this activity turned into a great way to explore emotions. Here are the happy monsters. 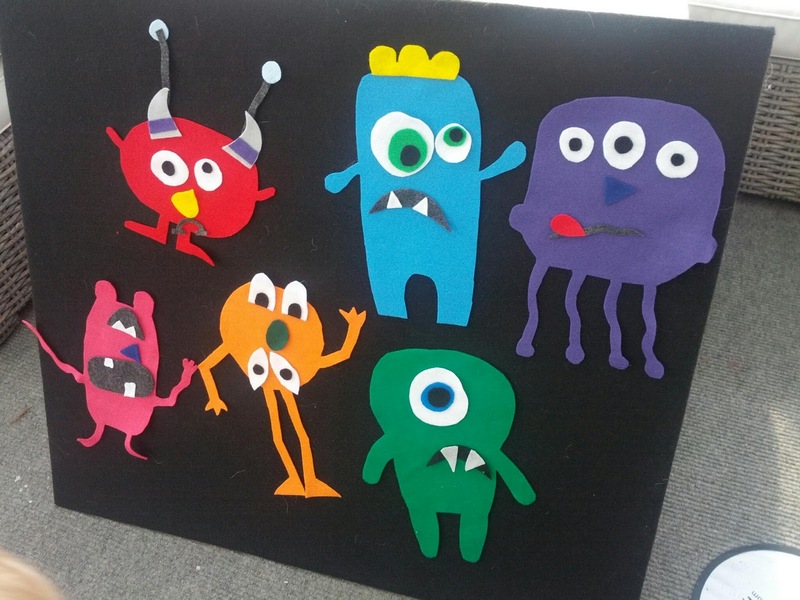 Here are some of his sad monsters. I am having a blast making all these new felt board sets, especially when they turn out so darn cute! Felt is one of the greatest things for making on-the-spot toys. I love the way it became an activity about emotions. 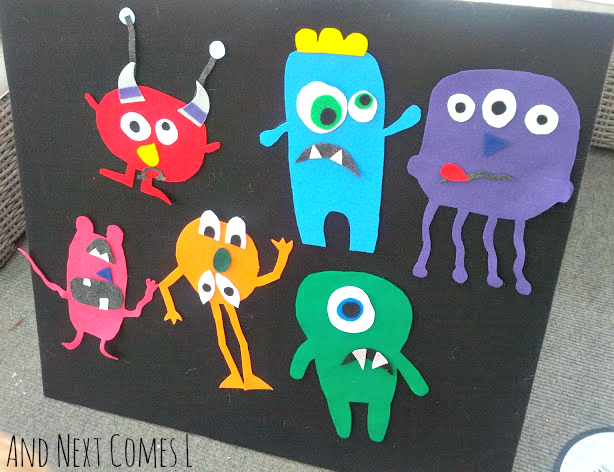 Those are some cute monsters! 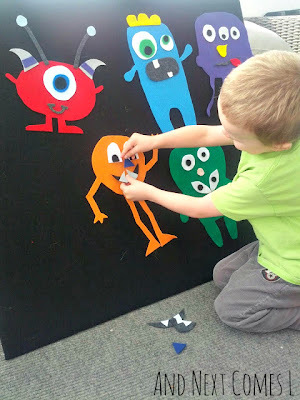 Dyan, this is such a creative "starter" project for building body awareness! I love the felt because it builds fine motor skills! Thanks for sharing. Will do the same! I appreciate you sharing, Katherine! 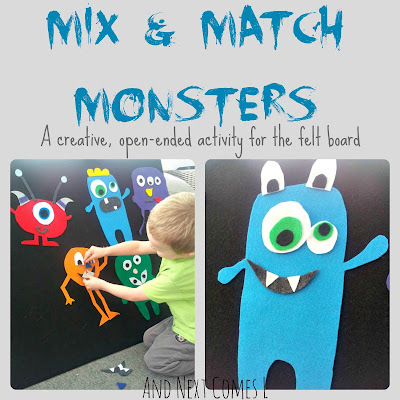 This is a great idea, just pinned it :) We have just discovered craft with felt & this looks like lots of fun. Found you on the weekly co-op at Reading Confetti. Felt is great. Thanks for stopping by! You serious are a genius with the felt activities. This one is so fun! I love all of the colorful monsters. Pinned. Thanks, Asia! It definitely turned out way cuter than I imagined! 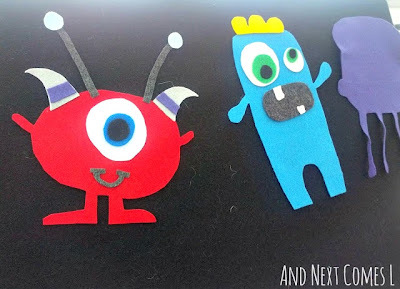 Your felt activities are unbelievable! I love these monsters! Aw, thanks. Wait until you see what else I've come up with for the felt board! I love these little monsters they are too cute! Such a fun idea! Thank you for sharing, Now following you. Thanks! The monsters are fun to create! I will pop over to your blog and check it out when I've got a moment. Thanks for following along. Hi, Bethany! To make my felt board, I used foam core board. I taped two pieces together side by side with duct tape and then I hot glued the felt on (just on the backside). I think I cut down one of the foam core boards to half of its size. 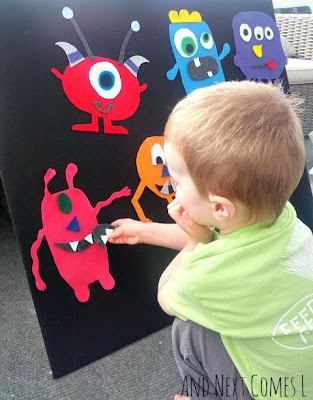 You can use canvases, picture frames, cardboard, or even a piece of plywood to make a felt board. As for size, mine is 34" w x 30" h. Hope that helps! Felt sticks to felt. Super easy, right? Where did you purchase the felt? I'm struggling to find some affordable felt to make this with. Also, did you make the board by gluing/taping/stapling the felt to some cardboard? For the felt, I bought it at Michael's and Walmart. As for the felt board, I wrapped foam core board with the felt and then adhered the felt to the back of the board using hot glue. 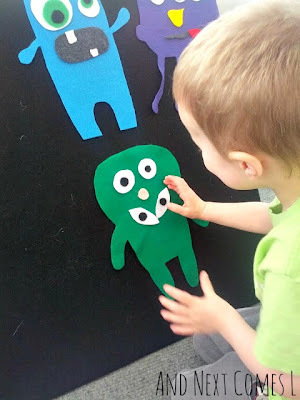 I stumbled across this post via Pinterest a few months back and decided to give it a try for the felt board we set out for kids to play with at my library. It's been incredibly successful! We have a lot of kids who the second they walk into the library say, "Mom, I want to make a monster!" It's been up for several months, and while we used to switch out the felt board activities every month or two, we've kept this one up just because we're all afraid of all the tears it might cause if we replace it! That's great to hear! Two years later and it's still a favorite at our house! PS: I would love to see a picture of your monsters. Either send me an email or share a photo on my Facebook page.